Recently, a friend of mine commented that she only ever saw me in either bright or super dark lipsticks. After surveying my ridiculously large stash, I realised that she was absolutely right. Unlike most people, it seems that my comfort zone lies in bold colours. Since I hate to be stuck in a beauty rut, I made up my mind to find a shade that could be classified as a neutral or soft colour. Upon seeing the NARS Powermatte Lip Pigment in ‘American Woman’, I knew that I had met my match. Here is my review. The lipstick comes in a matte black, rectangular tube. A transparent section down the middle gives a fair idea of the shade inside. The attached applicator is slimmer than most, which allowed the formula to reach every corner of my lips. Although it looks narrow, it definitely picks up enough product. The shade name is mentioned on a sticker beneath the tube. In terms of the formula, there were a few hits and misses. The fluid consistency allowed the colour to glide on smoothly, without any tugging. However, the thin texture makes it easy to overuse the product, so I recommend tapping the applicator against the lip of the tube to get rid of the excess. The formula also takes a few minutes to dry down and set in place, so once you are satisfied with the coverage, it’s best not to touch or press your lips for at least five minutes. ‘American Woman’ is a rosy pink hue with warm undertones and a matte finish. One coat is enough to completely cover your lips. The lipstick also has a subtle vanilla-like fragrance, which shouldn’t be a deterrent for most people. On the longevity front, this lipstick stayed put for about five hours, without flaking or bleeding. Whilst it did not leave a mark when I drank water, the formula definitely transferred during a meal. The biggest plus was that it did not dry out my pout or emphasize my lip lines. 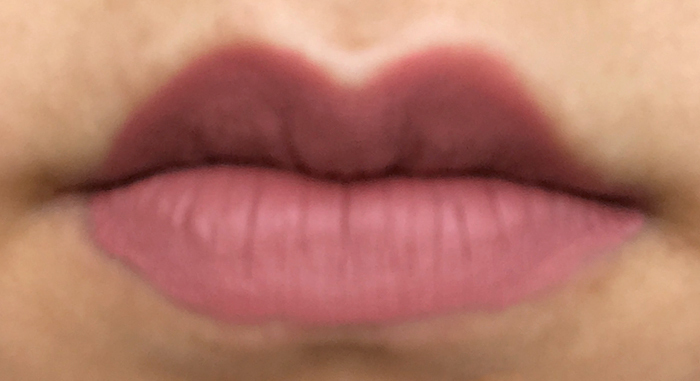 Pigmented, long lasting and comfortable, this lipstick is exactly as advertised. Whilst I still reach for my brights on a daily basis, I love the sophisticated vibe this shade gives off. When paired with a cat-eye or metallic shadow, this lipstick is the one for glamorous events and candlelit dinners. Plus, it got me out of my rut, which is always a good thing!